If you have tons of files stored in Windows, you know how hard it can be to find the right file when you need it. Fortunately, you can tag supported files in Windows 10 with one or more relevant keywords to make it simple to find them using Windows File Search. Not all files stored in Windows can be tagged. Tagging is only supported on images, documents, and videos. And, in some cases, even some supported file types may not allow tagging. Although it’s not intuitive to tag files in Windows 10, it’s also not difficult once you’ve walked through it a few times. There are two ways to find and use the file tagging capabilities in Windows 10: from the Properties Window and from a file’s Details Pane. Navigate to the file you want to tag and right-click it. In the Properties window, select the Details tab. On the Details tab, double-click the Tags line to add one or more tags, separating each one with a semicolon. Press Enter when you’ve finished adding tags to apply them to the file. You can select multiple files to tag them all at one time. Navigate to and select the file you want to tag. On the Ribbon, select the View tab. From the View Ribbon, select the Details Pane. In the Details Pane, click Add a tag and type the tags you want to assign to the file. Remember to separate tags with a semicolon. When you’re done, press Enter or click Save to assign the tags. You can select multiple files to assign the same tags to all of them, all at one time. Once you have tagged your files, moving them to another computer or an external hard drive that uses a different file system than the one on which the files were tagged could cause the assigned tags to be erased. Replace your keyword with the name of the tag you’re trying to find. 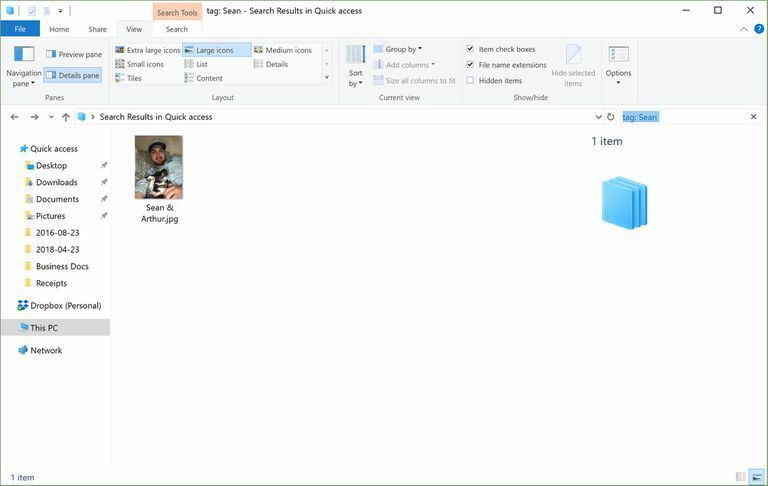 The search results should return only files that contain the specified tags.